Citrus stinkbug, leaf-feeding caterpillars, aphids, citrus leafminer, leafhoppers, plant hoppers, bugs, moths, adult black bugs, and small animals. The life cycle of the ant has four stages: egg, larva, pupa, and adult. The queen ant starts the ants' nests/colonies. She flies and searches for mate/s. She can mate with one or a few males ( one at a time) in the air, or on low vegetation, or on the ground. Once mated, she looks for a nest site, either on trees or open fields. Once situated, she gets rid of her wings, seals herself into a small chamber and lays a small batch of eggs. The eggs then hatch into larvae. The queen is located in one nest and her eggs are distributed to all the other nests where workers and soldier ants are found. She spends her life laying eggs. The workers are females and do the work in the nest. The larger ones are the soldiers who defend their colony. Fertilized eggs develop into females (workers and the queen) and unfertilized eggs into males. Female ants have 2 copies of each chromosome while males have one. The larvae feed on the unfertilized eggs as food which the queen lays especially for them. The first brood of workers are normally smaller since she can only provide a limited amount of food. Once the ants mature, they leave the nest and begin to look for preys. They bring food to the queen and their siblings so that later offspring are bigger. As the colony reaches maturity, it begins to produce the queens and males for the next generation. Males can remain in the nests for some months and most of them will die within a few days after leaving their nests. The larvae have special glands to produce lots of strong silks (adults do not produce silk). One colony is found over several nests that may be placed in various locations in a tree, or several trees, or in fields. The worker ants form a chain along the edge of the leaf and pull the edges together by shortening the chain by one ant at a time. Once the leaf edges are in place, each ant holds one larva in its mandibles and gently squeezes the larva to produce silk. The silk is used to glue the leaf edges together. Adult weaver ants are reddish to brown in color and have 10-segmented antennae with 2-segmented clubs. Their eyes are relatively larger than those of other species of ants. They do not have stingers, but can give painful bites caused by the chemicals secreted from their abdomen. They make nests in trees or on leaves of legumes, or in bunds or levees of the fields. They have the most complex nests among ants' nests. They use fresh leaves to build nests . Weaver ants get their name from their habit of binding fresh leaves with silk to form their nests. Their lifecycle spans a period of 8 to 10 weeks. Weaver ants thrive well in undisturbed places and plenty of green leaves. Plant fruit trees or shrubs in or around your new citrus orchard however, banana, sapodilla, and papaya are less suitable. Introduce only native weaver ants to the orchard when no black ants' species are present to ensure the establishment of a weaver ant colony. Provide them with food during the dry season such as dried fish and shrimp, cut into pieces that are small enough for the individual ant to carry. Put bamboo or wooden strips between trees to guide the ants to transfer from one tree to another for them to build new colonies in other trees. To expand weaver ants' colonies to other field crops, tie a rope to a tree where they live, to guide them to the areas you want them to colonize. Monitor regularly the ant colonies. Like other insects, ants are easily being killed by pesticide. Ask for assistance from your local agriculturist office. Van Mele, P.; Cuc, NTT. 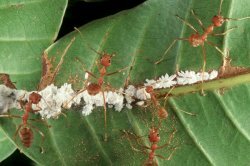 (2003): Ants as friends: Improving your tree crops with weaver ants. CABI Commodities and Cenicafé.